CENTER STAGE! 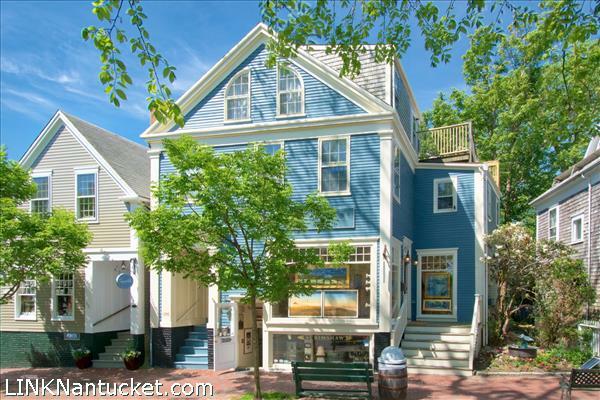 This elegant blue building is perched prominently on Center Street in the heart of Nantuckets core retail/commercial district. Comprised of two retail units through three floors of commercial space, this landmark property also boasts one of downtownâs most unique residences overlooking Town and Nantucket Harbor. With enormous display windows and excellent pedestrian and vehicular visibility, this property is ideal for retail use and offers a residential component for staff or separate rental. Each retail unit enjoys its own entrance and oversized display windows fronting on Center Street. The main commercial space is presently leased to Nathan Coe and Illya Kagans photography and studio; two additional leases are in place so advanced notice is required for showings. Call for more details or to schedule an appointment. Please send me more available listings similar to 38 Center Street, Town. Thank you!